Just a couple more weeks and we will be enjoying the great weather and hospitality of San Francisco. I am anxiously anticipating another great OpenWorld conference. As always, I look forward to meeting with you between sessions or in the demo grounds. 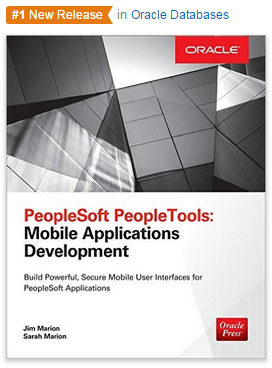 I will be presenting "PeopleSoft Developer: Tips and Techniques [CON8596]" on Monday, Oct 26 at 12:15 p.m. in Moscone West—3007. I find the OpenWorld/JavaOne content catalog a little intimidating. If you are presenting a PeopleTools topic, please post your session details in the comments below to help the rest of us find PeopleTools-related sessions. I received notice yesterday that our latest book, PeopleSoft PeopleTools: Mobile Applications Development (Oracle Press) 1st Edition, is now shipping. Probably the most exciting news is that Amazon has the book listed as the #1 New Release in the Oracle Databases category.